A China-made J-31 stealth fighter (background) lands on a runway after a flying performance at the China International Aviation and Aerospace Exhibition in Zhuhai, Guangdong province, Nov. 11, 2014. Chinese Air Force exercises over the contested South China Sea reflect opposition to recent U.S. naval maneuvers and an increasing wariness toward Taiwan, a self-ruled island that Beijing calls its own, scholars in Asia say. They warn of increasingly frequent drills by Beijing. The Chinese Air Force said on its website Sunday it had conducted drills in the South China Sea and part of the East China Sea near Japan’s outlying islands. It sent bombers and fighters on the mission. An aircraft carrier group passed through the Taiwan Strait last week just west of Taiwan itself, the island’s defense ministry said. China is using the maneuvers to warn Washington, which disputes Beijing’s claim to sovereignty over the whole South China Sea and Taiwan according to Collin Koh, maritime security research fellow at Nanyang Technological University in Singapore. China insists on eventual unification with Taiwan despite popular opposition to that goal on the democratically governed island. The exercises send a warning to Taiwan, too, said Andrew Yang, secretary-general of the Chinese Council of Advanced Policy Studies, a Taipei-based think tank focusing on military affairs. Chinese President Xi Jinping feels "more confident" in his military's performance at sea beyond immediate territorial waters, Koh said. Chinese President Xi Jinping speaks at the closing session of the National People's Congress (NPC) at the Great Hall of the People in Beijing, China, March 20, 2018. “It is a whole confluence of ongoing events throughout the region,” Koh said. "We can’t also deny the fact that these activities (by other countries) could very easily be used as justification by Xi and his party to shed upon the need for more intensified PLA activity." Chinese officials called the live-fire exercises a “routine part” of the navy’s annual training, the state-run China Daily online reported. But analysts link the exercises to the U.S. Navy’s passage in January of a ship near a shoal China disputes with the Philippines. Beijing said the naval ship had trespassed, but Washington says the 3.5 million-square-kilometer sea should be open to all. The aircraft carrier USS Carl Vinson’s port call in Vietnam earlier this month after a voyage through the sea put China on further alert. The U.S. government does not claim the sea that extends south from Hong Kong to the island of Borneo. But Brunei, Malaysia, the Philippines and Vietnam all claim parts that overlap waters that China calls its own -- about 90 percent of the whole sea. They value its fisheries and undersea reserves of oil and natural gas. In November, U.S. and Japanese vessels held exercises near Okinawa, near the northern extent of Beijing’s recent air force drills. Japan contests nearby tracts of the sea with China, a source of tension since 2013. In addition, analysts say, the U.S. government’s Taiwan Travel Act bothers Beijing. The act, signed in mid-March, encourages more high-level visits between Taipei and Washington. China opposes those visits, seeing Taiwan as Chinese territory rather than a state. China will try to “isolate” the Taiwan government and step up its “hardline approach” to warn it against declaring itself legally independent of China, Yang said. Taiwan and Japan sent military aircraft to track the Chinese fighter jets, but other governments that vie with China for maritime sovereignty had made little public comment as of Wednesday. The Philippine and Chinese governments are setting aside sovereignty issues to discuss joint oil and gas exploration in the South China Sea, taking some attention away from the air force drills, said Maria Ela Atienza, political science professor at University of the Philippines Diliman. But some Filipinos noticed the Chinese exercises. “The concern of course is you’re giving them too much room in areas that are supposed to be or at least being claimed by the Philippines, so there are people who are increasingly noticing the lack of stronger position when it comes to China,” Atienza said. China’s island-building since 2010 has upset the Southeast Asian claimants, leading to a world court ruling against Beijing in 2016. 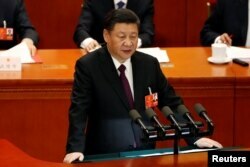 Since the ruling came out, China has strengthened relations by offering economic aid and investment. Southeast Asian claimants “desire to avoid public statement” on China's military activity, Koh said. The specter of more U.S. presence in the South China Sea, backed by Japan and possibly Australia in the future, is expected to raise the frequency of Chinese military exercises. China will “regularize” its military posture at sea and in the air, Yang said. During the National People’s Congress, a Chinese legislative session earlier in the month, Xi’s government announced an 8.1 percent military budget increase and called for more military-civilian integration to strengthen the armed forces.